ReStore find. Original NOS lamp, Westy made with Sears etch, remains inside. Oh nice...haven't ever run across one of these. I have at least one maybe 2, if so they are a 22 and a 32 watt. I also have a Sylvania FC16T10/GO, Gold! I have some Style House my "Monkey" Wards, too, made by Sylvania. Also have a rare Westy-made 22 watt CLP with the letters in the diamonds. NOS boxed, beautiful lamp! 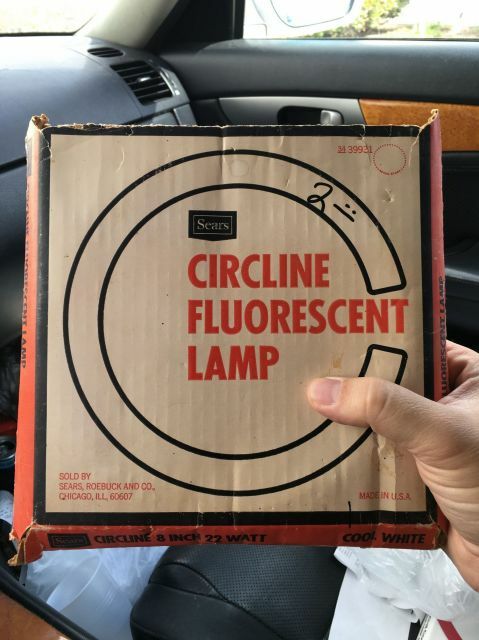 Folks---be careful with how you store the older "housekeeper" (metal-to-glass seals) seal circline lamps and Lumiline lamps--exposure to extreme cold WILL crack these lamps at the metal to glass junction and cause vacuum loss. i lost a bunch of my precious Lumiline lamps and vintage circlines to storage in un heated sheds. Moisture can also crack them by causing rust of the steel seal disk and the expansion of the rust cracks the glass, also these seal disks will rust out and get a pinhole leak as well, so store these lams in heated and dry areas so you don't suffer the same heartbreak I did. Rick D.